"WOW! ", "I'm obsessed" & "This one makes me more excited than I've been in a long time" are all quotes from the cattlemen who have seen this bull in person. He has massive bone, power and a huge top. But rest assured, he's not a short little pud - this guy also has the frame needed to produce some awesome females. 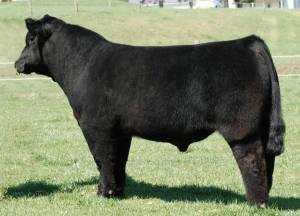 Regardless of if you're breeding for bulls or heifers, this is a One Night Stand you shouldn't pass up!